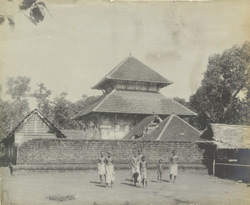 Photograph of the Shiva Temple at Chevayur in the Kozhikode district of Kerala, taken by a photographer of the Archaeological Survey of India on the 1st February 1901. The temples of Kerala have very distinctive features and their structure is largely influenced by the geographical and climatic conditions peculiar to the region. The monsoons and the abundance of forests clothing the Western Ghats explain the shape of the roofs which are made of wood and covered with tiling or copper plates. Their heavy overhanging eaves help shed the beating rains of the monsoons and their shape varies in accordance with the plan of the sanctuary. Temples built on a circular plan have a conical roof while square-plan sanctuaries are covered with a pyramidal roof. They often have different projecting tiers intended to protect the wooden structure of the temple itself. Most temples have been renovated and the roofs are now usually tiled. The base and the structure above are made of granite and laterite. The laterite walls of the temples are plastered in mud and lime.